Classic Media Productions is an established and reputable provider of services in multimedia. 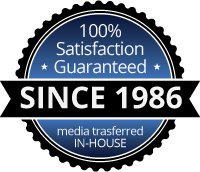 We pride ourselves on our ability to offer, to any client, a full range of possibilities in film, video, CD, DVD, Blu-ray, and web ideas to meet individual and industrial needs. We pride ourselves that we offer professional, personalized attention to our varied clientele, regardless of the size of their projects or their budgets. We encourage our clients’ ideas to grow in proportion to the constantly growing knowledge and incredible creativity of our staff. We pride ourselves on embracing artistry in our staff, and on each artist’s commitment to functionality, so that we ultimately provide our clients with exciting and purposeful communications, whether they are for personal or professional use. In 1986, Joe Mulvey founded Classic Video Productions, Inc., locating in a small space in Downers Grove, IL, outside Chicago. Joe decided to start his own company after spending many years in corporate finance, with a desire to create a comfortable atmosphere for employees and clients in a service organization that is among the most reputable and complimented in its industry. In those days, the primary services revolved around duplication of videotape for companies in the area, like Frito-Lay and Armour Swift Eckrich. Also seeing the possibilities in the personal consumer market for video, Joe began transferring photographs and home movies into the more durable medium of videotape. The company branched into wedding and special-event videography with great success. Both sides of Classic’s business remain to this day–almost equally weighted in attention to customers and in revenue. It is the comfortable, competent atmosphere for which Joe sought, that fuels the personableness and success of the company, always seeking new technologies and adding services. As new media open, Classic is there to find creative ways to prove its reputation. In 1995, the company ventured into web design. Since weddings were a definitive portion of the business at that point, Classic logically focused web ideas in that direction and created a wedding portal for the Chicago area. That portal was pitched to and picked up by Opus Publishing in New York City, a major periodical publisher that eventually became part of Modern Bride. As the web industry boomed, Joe decided to spin off the web design into a separate company, and eWebs.net was created in 1996. Classic focused on video production and moved farther into the industrial world, expanding its client list and services to produce training videos and conference event recording. The two companies work closely together. In 1999, Classic needed more space to accommodate larger projects and staff. Joe purchased a larger space, still maintaining roots in Downers Grove. The company found itself creating productions for schools, churches, health-related companies, and both large and small industrial companies, as well as maintaining a large home-consumer base, delighting clients who sought “special tributes” for weddings, birthdays, and anniversaries. 2001 and 2002 found the DVD market springing forth, and Classic leapt as well. Transferring material to DVD, as well as authoring and editing DVDs is now a staple of the business on both personal and professional sides. The industrial side of the business expanded exponentially in those years. In 2008, Classic upgraded to state of the art High Definition equipment. Classic continues to thrive, adapting to and embracing new services, while consistently maintaining their root services and treating all clients with equal attention. Anything you may need or want or dream of doing to enhance your personal or professional use of visual and audio media can be addressed by Classic Media Productions. The company is fueled by customer need, and continues to find creative and purposeful ways of meeting your goals. We continue to expand in both state-of-the-art equipment and by bringing in talent to enhance our conception, production, and editing capabilities. We invite you to browse our site or call. If you have an idea of what you want, call to discuss your project or set up an initial consultation. Rest assured you will be treated like one of the Classic family from the beginning, and the best work possible will emerge as your media project. Thanks for visiting, and we hope to talk with you soon!